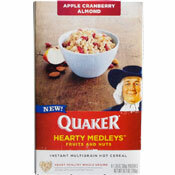 The complete name of this product is Quaker Hearty Medleys Fruits And Nuts Instant Multigrain Hot Cereal. I tried two varieties: Apple Cranberry Almond and Banana Walnut. Both are prepared according to traditional instant oatmeal cooking methods. I used the microwave instructions. This product is called a hot cereal instead of an oatmeal because the base of the product is a multigrain blend consisting of whole grain rolled rye, whole grain rolled oats and whole grain rolled barley. First Impression: The cooked product is appealing to the eye. Apple, cranberry and almond pieces are visually apparent throughout. The aroma is similar to Quaker's staple Apples & Cinnamon Oatmeal. Taste and Texture: The most prominent flavor is apple, with apple pieces present in every bite. The almond pieces lend an occasional crunch. Cranberry pieces are the rarest of the special ingredients, but when you get one... you know it. They add a sweetness and a slight tang. Conclusion: The flavor combination here is interesting, but far from exciting. 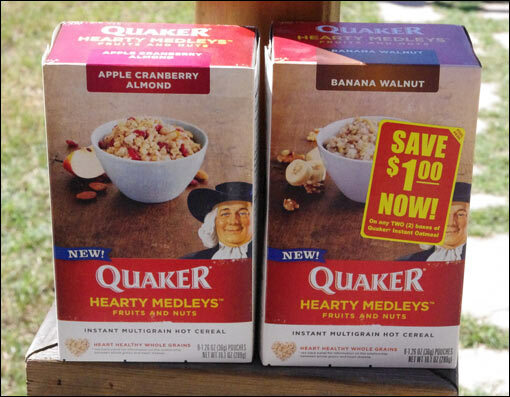 If you like Apples & Cinnamon Oatmeal, you might like this variety of Hearty Medleys. First Impression: This product smells like a freshly baked banana nut muffin when prepared. It's the less attractive of the two varieties as the banana pieces have a mushy appearance once they've reconstituted. Taste and Texture: This hot cereal tastes more like a multi-grain cereal. The bananas pieces - while present in every bite - are less effective at masking the grainy flavors at the cereal's core. Like the almonds in the other variety, the walnut pieces here add a welcome crunch. An interesting aspect of this cereal is that the banana flavor becomes more intense the more you eat. If you find the flavor of this product bland at first, hang in there. By spoonful five or six, it's pretty good. Conclusion: If your a big fan of banana bread or banana nut muffins, there's a good chance you'll like this hot cereal. I declare a tie. 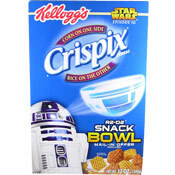 Both hot cereals are quality products with flavors that will appeal to select consumers. But neither are interesting or exciting enough to entice you away from your favorite oatmeal or ready-to-eat cereal. For a hot Quaker cereal that's more likely to make your regular shopping list, check out their True Delights Instant Oatmeal. Nutritional Considerations: Each single packet serving of these hot cereals has less than 150 calories, 2.5 grams of total fat (0 saturated and 0 trans), no cholesterol, 27 grams total carbs, 3 grams of dietary fiber, about 12 grams of sugars and 3 grams of protein. The price below represents a per box sale price with a coupon applied. What do you think of Hearty Medleys Hot Cereal? I like them both but can't find them anywhere now! The Banana Walnut was great! Now I need to look for a new favorite hot cereal. I'm glad I bought all 11 boxes when I saw that it was a discontinued item at my local market. Unfortunately that was 5 months ago and I'm almost out. Does anyone know where I might find more? My son's favorite (and only) oatmeal and now I can't find it anywhere. He used to like the Simple Harvest and that was discontinued. Not very happy with Quaker's fickle product offerings. I loved it and now I can't find it! I don't like the cranberry kind, either. The cranberry texture is gross, and... I'm not a huge fan of cranberry anyway, I'm not sure why I got it. lol. My wife got a sample at grocery store. It had a very bad medicinal taste. She tossed it after a single bite. I got the cranberry kind and it is extremely sweet. Overpoweringly sweet. No thank you. I will go back to my steel cut oats and add my own almonds, cranberries, etc.